In a few days, I'm going to hit the halfway point of my pregnancy, and I have been having some serious cravings! Mostly good things like apples and grapes... some not-so-good things like chocolate milkshakes and fries. Another weakness of mine recently has been pesto. I could seriously slather that stuff on anything! I decided to make a baked pesto chicken for dinner tonight and add some cheese and tomato freshly picked from my garden. Oh, my goodness, was this fantastic! If you're a pesto lover, this is a must make! Preheat oven to 425 degrees. Lightly grease a baking dish. Cut the chicken breast into serving pieces and season with salt and pepper. 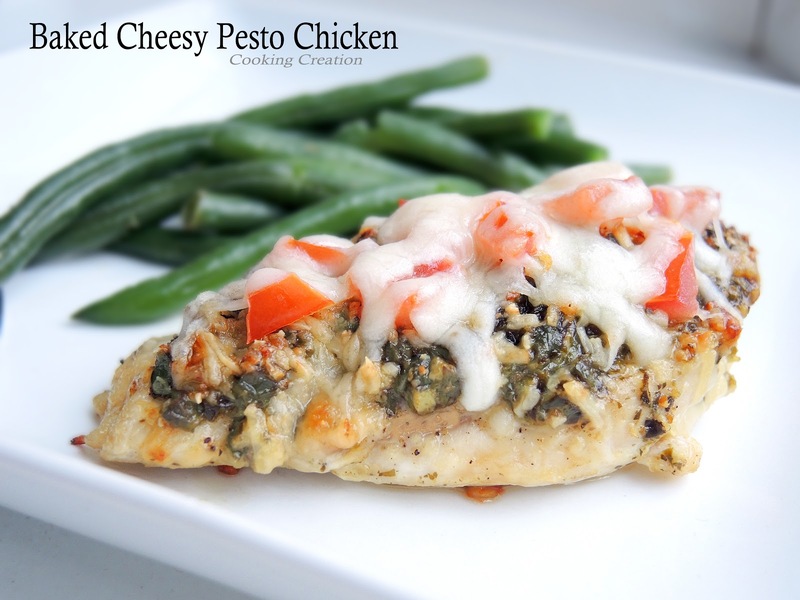 Evenly spread pesto on top of the chicken and sprinkle Parmesan cheese evenly over all. Bake for 20 minutes. Remove the chicken from the oven and top with tomato and evenly sprinkle mozzarella cheese over all. Bake another 5 minutes, or until cheese is melted and the chicken is cooked through.